Topics: Ice Sculpture Info, Order Info, Art The Experience, Winter Festival Entertainment, Ice Carving Classes, and Team Building Exercises. 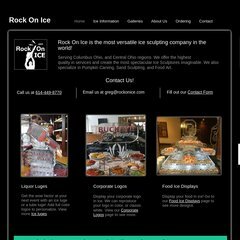 rockonice.com Ice Sculpture Favorites - Ice Sculptures, Ice Bars, Ice Carving by .. It is hosted by The Endurance International Group Inc (Massachusetts, Burlington,) using Nginx web server. Its IP Number is 65.254.250.108. It has 2 DNS records, ns2.powweb.com, and ns3.powweb.com.